First Half Marathon – Your Life. Your Hustle. Just signed up for my first ever half marathon. I’m jumping right from a 5K to a half marathon. Yes that’s a 10 mile difference (exactly). I feel a little crazy but I’m excited. 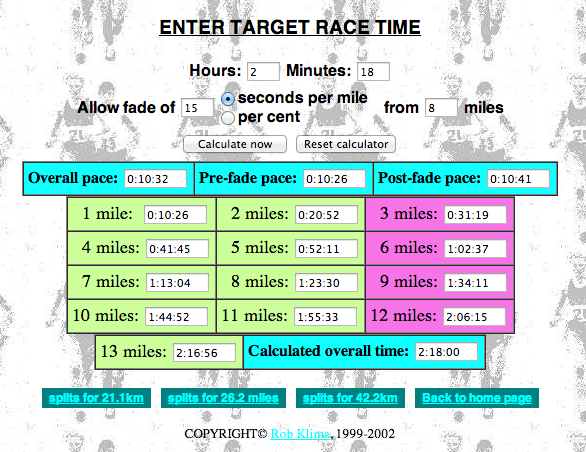 Great website for calculating pace: http://www.users.on.net/~klima/rkcalc_hmi.htm. Here are my initial calculations based on what I feel I can run. Granted the longest distance I’ve run is 7 miles at once and my pace was 9:41/mile. I’d love to keep that pace but we’re talking almost double the distance! I’m mostly concerned about my joints! Need to lose about 20 more pounds before race date. I can do it … heck I’ve got 3 months! I’ve signed on to a training program via RunKeeper. Summer time running is very tricky for me … I get too over heated. Thank goodness this run is in the late autumn so temps will be really cool. The course is also relatively flat which is also in my favor since my runs are hilly. Let’s do this! !